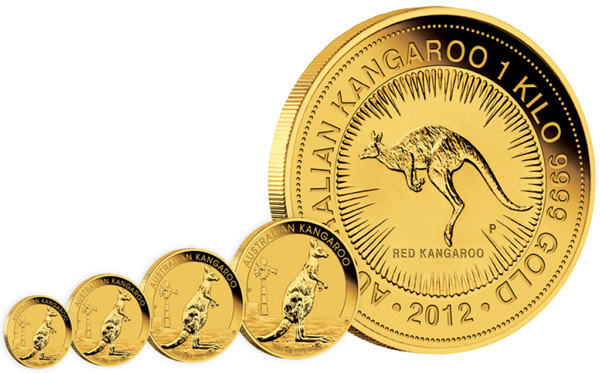 On October 4, 2011, the Perth Mint began sales of the 2012 Australian Kangaroo Gold Bullion Coins. Struck in 99.99% purity, these coins are available in sizes ranging from 1/10 ounce to 1 kilogram. The new reverse design for the 1/10 ounce to 1 ounce size coins features the image of a kangaroo with a bush scene and windmill in the background. The Perth Mint’s “P” mint mark appears along with inscriptions “Australian Kangaroo”, the date “2012”, the size, and the purity “9999 gold”. The 1 kilogram sized coin features the classic kangaroo design by Dr. Stuart Devlin AO CMG, goldsmith and jeweller to Queen Elizabeth II. No more than 350,000 1 oz coins, 100,000 1/2 oz coins, 150,000 1/4 oz coins, and 200,000 1/10 oz coins will be produced. The 1 kilo coins have an unlimited mintage. What is the price for 2012 1 and 2 ounce Proof Australian Gold Kangaroo Coins?